Murphy pictured during Leinster's squad session at Donnybrook yesterday. IN A MOVE which demonstrates his desire to further his international career, Jordi Murphy, the 18-time capped Ireland international, will end his seven-year association with Leinster at the end of the season to join Ulster. Murphy, 26, is set to link up with former Ireland defence coach Les Kiss and ex-Leinster forwards coach Jonno Gibbes in Belfast from next season, in a signing which considerably boosts Ulster’s back-row ranks. The news was first reported by The Irish Times this morning, and The42 understands discussions have taken place between the northern province and the player and his representatives. Although an announcement isn’t expected just yet, Kiss is likely to field questions about Murphy’s switch north when he faces the media tomorrow ahead of Ulster’s Champions Cup clash with Harlequins on Sunday. 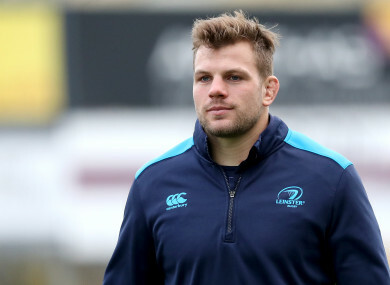 Murphy himself will hope to be involved in Leinster’s Pool 3 clash in Exeter, but the former Blackrock College student has fallen down Leo Cullen’s pecking order of late having returned from an anterior cruciate ligament injury. Since his return from the 10-month layoff, Murphy has been in fierce competition with as many as five international back-row forwards at Leinster and missed out on selection for the games against Munster and Montpellier, before being left out of the matchday squad entirely for the bonus-point win over Glasgow Warriors. That said, he has featured nine times for the eastern province this term and scored his 17th try in blue during the Pro14 victory over Benetton Rugby at the weekend. Overall, he has won 95 appearances for Leinster. Originally omitted from Joe Schmidt’s November internationals squad, Murphy was called into camp for the second Test against Fiji following injuries to Dan Leavy and Tommy O’Donnell. He won his 18th cap against the Pacific Islanders at the Aviva Stadium, coming over a year since his last. The flanker signed a new contract with Leinster at the end of the last season but as is the province’s policy, the length of the deal was not disclosed. Murphy will become Ulster’s second addition ahead of the 2018/19 season when his switch is officially confirmed following their capture of former Leinster prop Marty Moore from Wasps. Email “Jordi Murphy set to end seven-year association with Leinster to join Ulster”. Feedback on “Jordi Murphy set to end seven-year association with Leinster to join Ulster”.